This is a focused meeting, intended to bring together a small number of leading research groups in applied geometry, i.e. geometric design, geometry processing and discrete differential geometry. It follows two highly successful workshops in Bad Herrenalb, Germany (2010) and Hurdal, Norway (2011). We aim to follow the structure of the previous meetings; a slot of two hours for each group with two slots each morning and on one afternoon. The other afternoons are free for working groups, discussions, or leisure. We expect a lively exchange of new ideas and excellent networking opportunities for the upcoming generation of researchers in the field. The programme, with an associated list of abstracts and participants, is available from this link. Participation is by invitation only. There will be no registration fee, but no funding either. 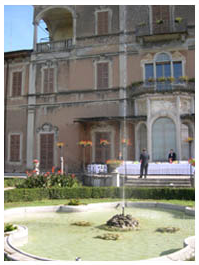 The Villa Cagnola Conference Centre is situated about 40 km northwest of Milano and 20 km north of Milano Malpensa international airport. We expect to provide a shuttle service from the airport to Villa Cagnola on Sunday afternoon and evening and back on Friday afternoon. or using the new S30 line from the train station in Malpensa Terminal 1, although this provides only one train every two hours. To transfer between Malpensa Terminal 1 and Terminal 2 there is a free shuttle bus. For information on all of these options, it might be easiest to search using the Trenitalia website for journeys from "Malpensa Aeroporto" to "Gazzada".